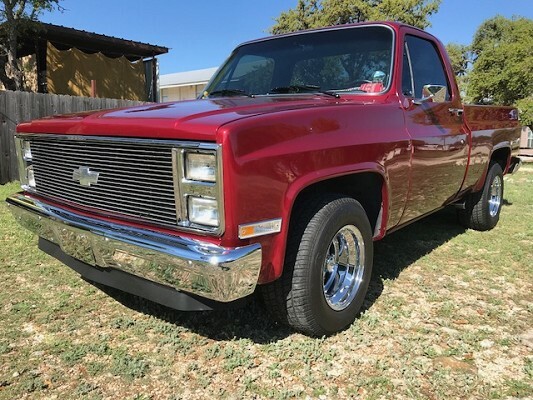 "always a big help thank mautofied"
Beautiful 1984 Chevy C10 Single Cab Short Box Fleet Side Pickup Truck. Everything is "New". Book of receipts for this truck. Crate 355 cid 425 hp (Dino 433), automatic transmission Turbo 350, 3.73 rear gears, Keith Black Top Pistons, XE-284 Comp Cam, 750 double pumper,Xtreme Energy 204 H-10 hydraulic flat Tappet camshaft,(lift .507"/520" & duration 204/296 degrees).RPM range 2500-6500, 15" chrome Cragar wheels wrapped in Cooper Cobra 275/60R15 all four corners, dual exhaust in front of rear tires, power steering, power front disc brakes, power windows and door locks. Factory A/c, not installed (have in box), factory original styled Am/FM/Cass Radio, Custom grant leather wrapped steering wheel, Custom polished Billet rear view mirror, Billet inserts in dash, all new interior dash pad, carpet, bench seat and headliner. Painted House of Kolors Candy Wine. Absolutely No Rust. Gone through from top to bottom , front to back. This is one Clean truck. You won't find one like this, for this price. Come on down and take her home... More pictures at link below.